The Polaris booster pump is the driving engine for the Polaris pool cleaner. The booster pump provides a higher pressure then the swimming pool pump can so it can drive the Polaris cleaning unit. From time to time your booster pump will need some repairs or could have a problems that can only be diagnosed with some booster pump troubleshooting. Some common things that go wrong with the Polaris booster pump are bad mechanical pump seals, overheated suction and discharge fittings and leaks from the Polaris quick connect fittings. 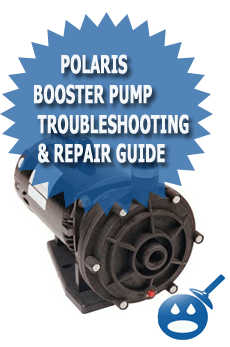 All of these problems can be fixed with a few replacement parts that are available online or from your local swimming pool supply store that carries replacement Polaris booster pump parts.To avoid costly booster pump repairs you should always replace the small parts that are starting to show wear or damage right away. This means if you start to see your pump seal leaking, don’t wait until it gets so bad that you cannot run the pump. Soon as you see it leak replace it. This goes for anything else you see going bad on the pump. If you feel that something is going to break or looks like its damaged, you will want to shut the pump off right away and fix the problem. Ignoring or “putting off” the problem with the pump will only let the problem become worse and that will usually cost you more money and time to do the repairs. The Polaris booster pump seal is located inside of the seal housing. You will have to remove the front of the pump to first access the impeller. Once you have the front of the volute off you will want to now remove the impeller. In order to remove the impeller you will have to grab the back of the motor shaft and then with your other hand you will want to twist the impeller counter clockwise spinning it until it spins completely from the motor shaft. Now that you have the impeller off you will want to unbolt the seal housing from the frame of the motor. Once you remove the seal housing you can remove the seal base. This is just one part of the mechanical pump seal. The second part of the Polaris booster pump seal will be in the small shaft of the impeller. You will also want to remove this part from the base of the impeller, as you will be replacing both parts of the booster pump mechanical seal. Once you have removed both the pump seal seat and the spring from the impeller you can replace both parts for the new replacement Polaris pump seal that you have bought. It’s always a good idea to put a tad of silicon on the outer rubber casing of the seal seat. This will hold the seat in place inside the seal housing and also safeguard the seal base from leaking. After you insert the seal base you can slip the other part of the mechanical seal onto the impeller. Now you can turn the impeller clockwise and thread it back onto the pump shaft until it’s tight. Once the Polaris pump impeller is tight you can re-assemble the rest of the Polaris pump as the pump seal has now been changed. The Polaris booster pump could have some suction leaks in a few common places. 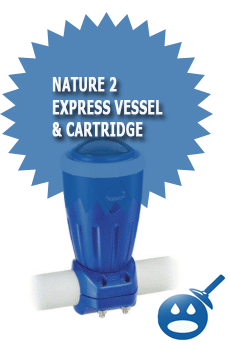 The most common places that the booster pump will draw air from is the suction fitting and the volute drain plug. To avoid any air being sucked into the Polaris pump you will want to make sure that you Teflon tape both he threads on the suction fitting and the Polaris pump drain plug. 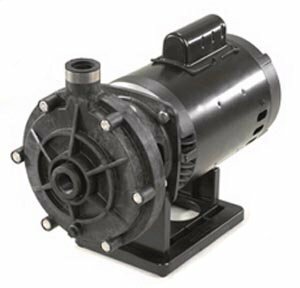 The Polaris booster pump can be piped directly into your swimming pools filter system using PVC pipe or it can be installed with saddle clamps that can be connected to the existing swimming pool plumbing. Either way there is only one correct way to hook up the Polaris booster pump. There is two fitting on the booster pump. The fitting in the front of the pump is called the suction fitting. This fitting will get connected to the discharge side of the swimming pool fitting. This is very important, as you will need to feed the suction side of the Polaris pump with pool water from the filter system. That is why you need to hook it to the discharge side of the pool system. 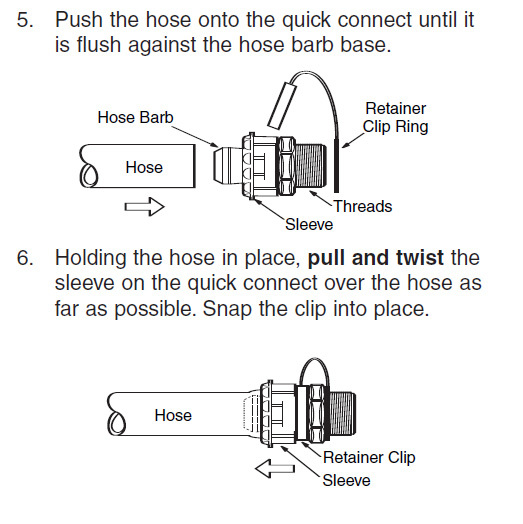 The second fitting or the second connection you will make is to connect the discharge side of the Polaris booster pump to the line that returns back to the pool or to a flexible line that will go to the pool. Whether the Polaris is hooked to the wall fitting in the pool or if its being feed from a flexible like from the top of the discharge side it is important to remember that the Polaris 360, 390 or the Polaris black max are pressure driven units. The booster pump will run if the pool pump is running. This is a safe guard to make sure that the proper amount of water flow is going through the booster pump. As we explained above the Polaris pump needs water from the discharge side of the swimming pool pump so when the Polaris pump is wired by the electricians it should be wired to only come on when the pool filter and pump are running. To turn on the booster pump you will want to first turn on your swimming pool pump and let it come to full prime. Once the swimming pool pump has been running for a few minutes you can either turn the booster pump timer switch or on use the manual switch that will be located somewhere near the filter system or the timer control panel. Some pools will have both the manual Polaris override power switch and the Polaris timer and some will just have one or the other. Depending on who built your swimming pool will depend on how they wired your Polaris pool cleaning system. If you have a timer on your Polaris swimming pool cleaner you will want to set it to go on 30 minutes after your pool filter timer comes on. You will want to have the Polaris cleaner shut off about 45 minutes before the filter system does. To set the timer on the Polaris you first will have to locate the time box. Once you locate the time box you will want to open the timer cover door and inside you will see a dial and two-timer pins. These timer pins will each have a small setscrew in them that you can loosen by hand. One time pin will say off and one timer pin will say on. If you turn the setscrews to the left, which is counter-clockwise you can loosen them and then slide them on the dial to the correct time. Once you have the off and the on pin set you can switch the timer on and if its between those times and the pool filter system is running your Polaris will start working. Answer: No, The swimming pool filter system actually filters the pool but the Polaris unit will pick up and bag the debris inside of the pool. 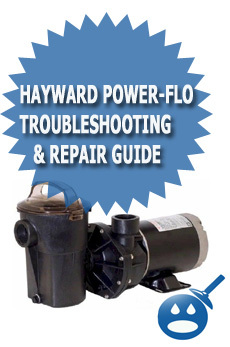 Answer: Most pump or motor repair shops can repair the Polaris pump. I have a leak around my plug of polaris pump. Is this common to get? Would getting new plug fix it? Please advise. The Polaris is working but it’s now extremely loud. Someone suggested it could be coming from the ball bearings. Please advise. Pump has a high pitch whine,what can I do? My circuit breaker to the booster pump trip after about 45 minutes. How would I know if my motor is bad? It’s not making any noise and the Polaris is cleaning fine. Polaris pump comes on for about 4 seconds then blows breaker, polaris works for the 4 second it is on.. Does not seem to be any back pressure etc. pump has been off for about 2 weeks while away. Any ideas what could be the cause of problem, filter and every thing working well. Hi there,I check your new stuff named “Polaris Booster Pump Troubleshooting & Repair Guide | Wet Head Media” daily.Your humoristic style is witty, keep up the good work! And you can look our website about proxy server list. I have an older PB-4 booster pump (1998) and it does not seem to have any way to brace the motor drive shaft in order to spin off the impeller. There is a hole in the rear of the shaft. But it does not accommodate any standard Allen wrench or screw driver. How do I get the impeller off? I replaced the seals on my Polaris booster pump as well part 5 and the impeller and shaft o ring. However, water is still leaking from the shaft. Any suggestions? The hose on the top of my polaris blows off and the water shoots up all over. and clamped it tight but it still blows off. Please help. Same problem here. Any advice? I have a new Polaris PB4-60 booster pump. It runs for about a minute then clicks off. Does this every time. What could be the problem??? Please help. I have a new PolAris pb4-60.Election wired. It but shaft does not turn when power is turned on?